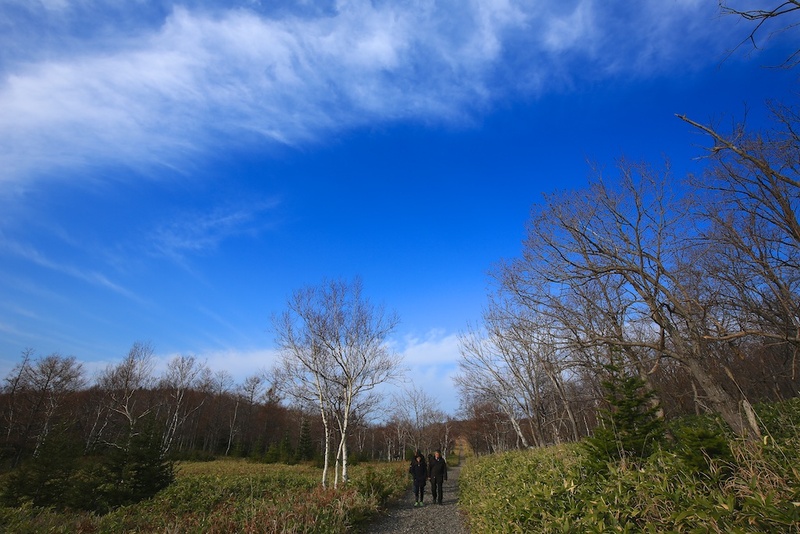 This marked the start of my awesome travel photography experience of a lifetime with newfound photography friends for Central/Eastern Hokkaido Familiarisation Trip (Photographers Invitation Program). Meeting at Changi Airport Terminal 1, I got to meet this special band of photographers that were going together on this big adventure. Departing on Japan Airlines JL36 to Haneda Airport, Tokyo at 2200hrs Singapore time, we arrived at Haneda Airport at around 0530hrs Japan time. It was a pretty smooth flight to Tokyo and we cleared immigration and customs, proceed to domestic flights section for a bus ride to the domestic terminal at Haneda Airport for Japan Airlines JL1183 to Memambetsu Airport in Hokkaido at 0700hrs Japan time. The domestic flight from Tokyo to Hokkaido was smooth, arriving at around 0830hrs Japan time. During our descent to Memambetsu Airport, we had our first glimpse of the beautiful Hokkaido from the air! Walking out of the plane onto the aerobridge, we can feel the chilly cold autumn transiting into winter weather. The warmth inside Memambetsu Airport was most welcome for us! Mr. Higasa Kazuma – General Manager, International Travel Division of Nippon Travel Agency Hokkaido Co Ltd.
Mr. Tsuyoshi Kato – Hokkaido Photo Guide, Travel Planner, Photographer, Translator and Driver. We went to the washroom and change to warm winter attire first before we formally exchanged greetings, formalities and name cards with Mr Higasa Kazuma and Mr Tsuyoshi Kato. After the introduction and briefing, we loaded our luggage into the mini bus for our start to Central/Eastern Hokkaido photography exploration! Our first destination was the Utoro area in the Northeastern part of Hokkaido, the journey from Memambetsu Aiport was around two hours and this was our first taste of long travel between destinations that we were visiting in Hokkaido. During our drive to Utoro, we were introduced to Mt. Shari-dake, with the peak at 1,545m! Lunch was a quick pit stop at a local 7-11 convenience store in a small town along the route to Utoro. 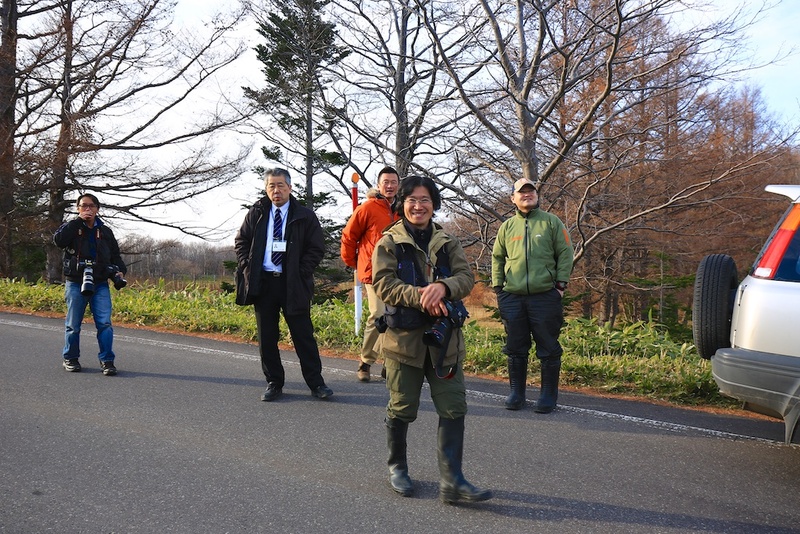 We had to rush over to Utoro since we had a professional Japanese Photographer, Mr Junichi Yamamoto, waiting for us at Utoro to bring us around Shiretoko National Park! Our first stop was Furepe Waterfall; it was a short trek inside to the edge of the cliff/plateau, through the forest. During this short trek, we were able to view the beautiful and grand Mt Rausu-dake, standing at a height of 1,661m, with the peaks and ridgelines covered with snow! 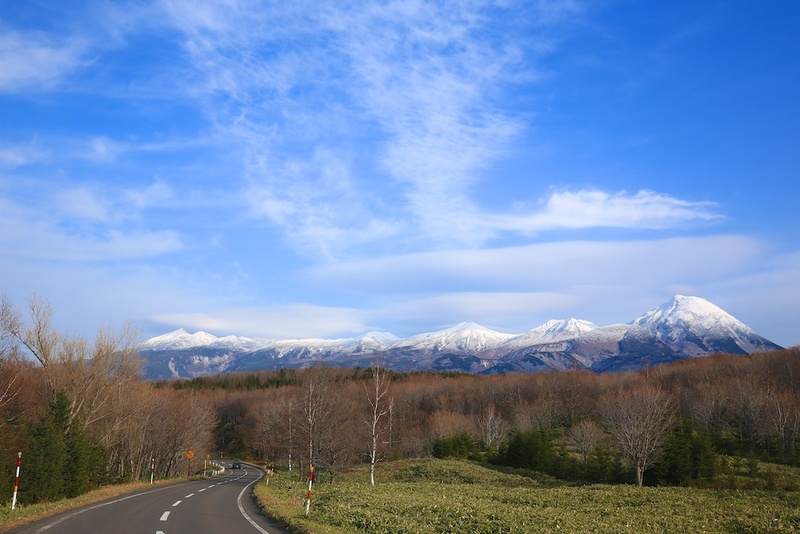 The landscape was amazing and very beautiful, snow white peaks, blue sky, amazing cloud formations and the foreground of trees, and grassland in autumn weather conditions. When we reached to the edge of the cliff, there was a lookout point/hut that visitors can go up to catch a better view of the Furepe Waterfall. 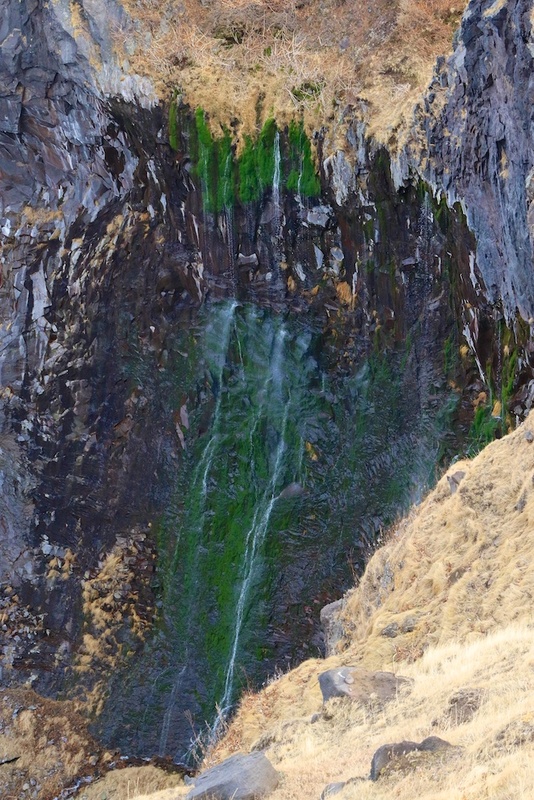 Initially, I couldn’t see any river flowing down the cliff forming the waterfall. Where is Furepe Waterfall, I ask myself? 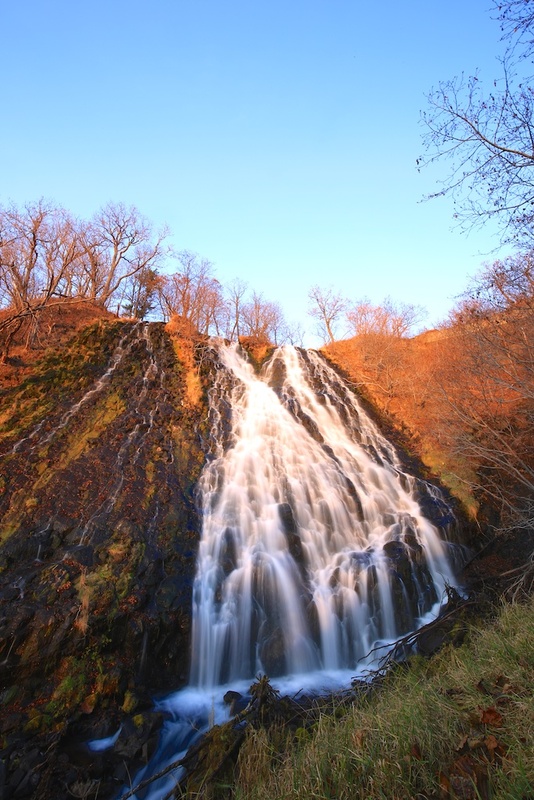 Soon, it dawned upon me with words from photographer friend of Yamamoto Sensei, who explained to us that the waterfall was from the underneath the rocks formation! Zooming in close with my telephoto lens (Canon EF 70-200mm f4 L USM), I saw for myself Furepe Waterfall! Mr Yamamoto Sensei brought us to the next destination, not too far away from Furepe Waterfall. 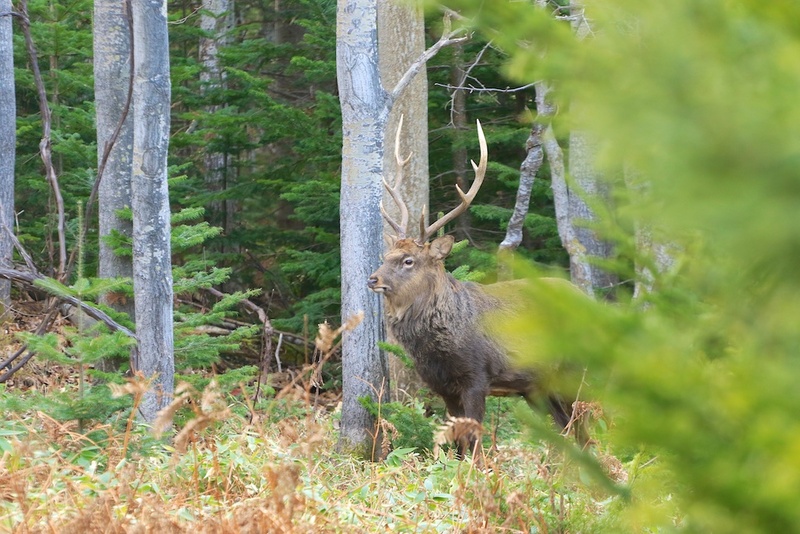 While trekking through the forested area, we managed to spot wildlife, the deer! Being in the wild, the animals were very sensitive to human beings and once they sensed us moving close towards them, they would start to move away to somewhere else. It was a very fun experience to be that close to the deer grazing and my Canon EOS 7D Mark II with 70-200mm f/4 L USM is perfect for photographing wildlife while on the move! We continued with our photography and travel exploration to Yunohana Waterfall, not too far down the road from Furepe Waterfall. Trekking to Yunohana Waterfall was very interesting whereby we spotted more wildlife in the forested area. Yunohana Waterfall is very similar to Furepe Waterfall, the waterfall is from the underneath the rocks formation! Mr Yamamoto Sensei was really very nice and showed us good photography spots to take photographs of the Yunohana Waterfall, besides that, Mr Yamamoto Sensei was sharing with us his local knowledge of the wildlife and vegetation, it was very useful learning and very interesting! 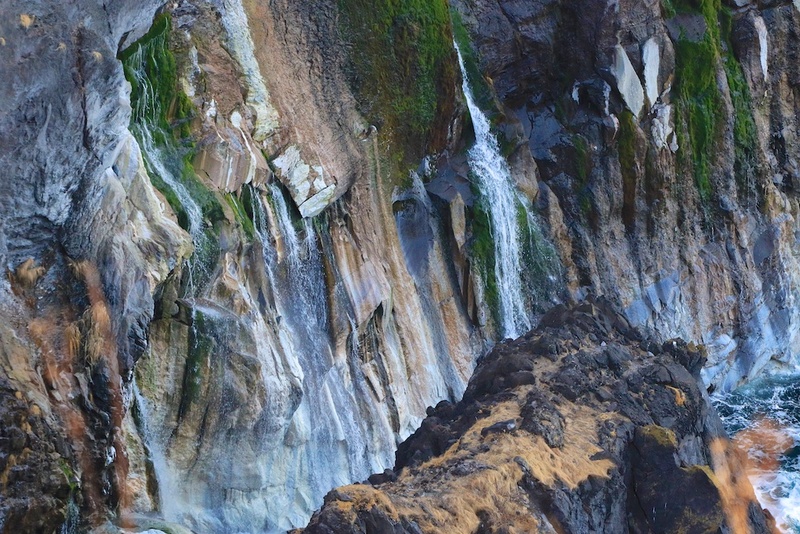 This is a very beautiful waterfall, along the costal road of Utoro. When we reached there, it was getting close to sunset and the sunrays that shined brightly on the slopes of the waterfall, giving it a golden brown landscape and waterfall. At Oshinkoshin Waterfall, we started to experience the cold winter weather coming in and we can feel the coldness! 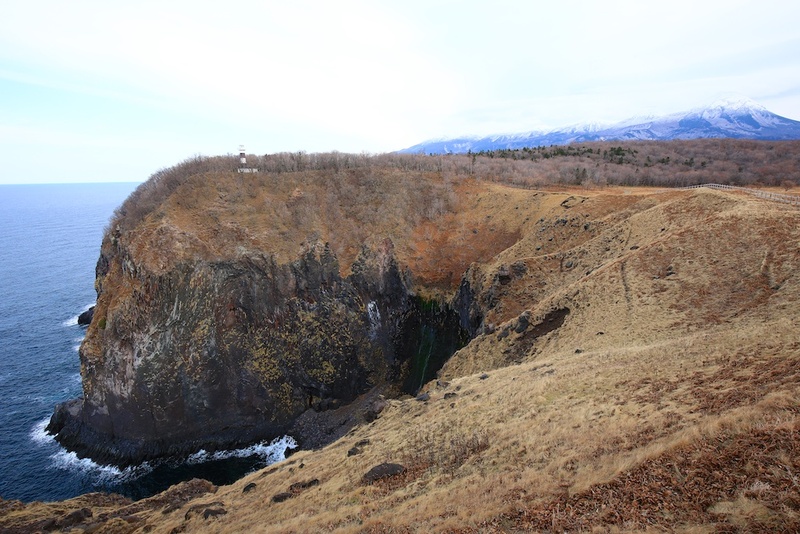 From the steps leading up to Oshinkoshin Waterfall, we were able to have a nice view of the sea and the upcoming Hokkaido sunset. Oshinkoshin Waterfall is really beautiful and we spent a bit more time there! I am a photographer that loves taking photographs of sunsets especially when visiting different countries. When I saw the incoming Hokkaido Sunset at Oshinkoshin Waterfall, we knew we were going to get a beautiful Hokkaido Sunset and we were all looking forward to it! There was a bit of rush to this location along Route 334 between ‘Oronko Rock’ and ‘Base of the Setting Sun’. Once we disembarked, the band of photographers started firing away with their cameras. 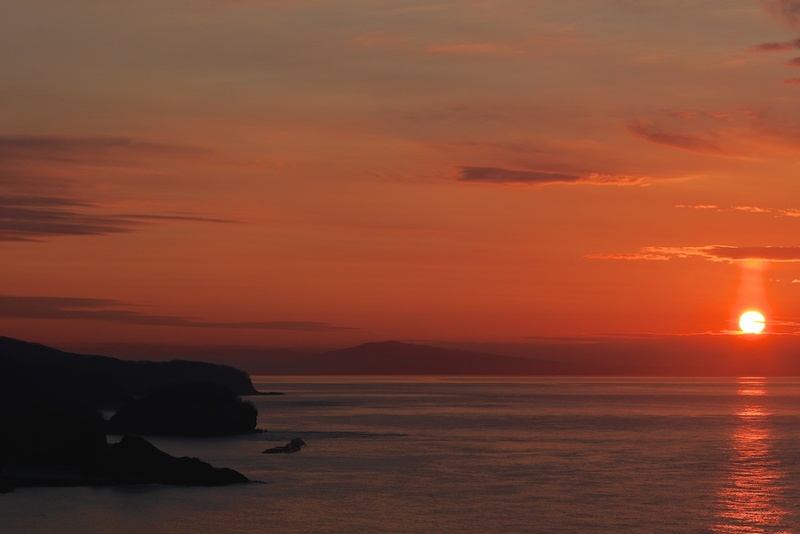 I was very happy to capture a beautiful Hokkaido Sunset and the Hokkaido Sunset memories still stays inside me today! Landscape photography tips: I shot the Hokkaido Sunset at Utoro using 2 Canon DSLR bodies setup, namely Canon EOS 5D Mark III with EF 16-35mm f4 L IS USM and Canon EOS 7D Mark II with EF 70-200mm f4 L USM. The Canon EOS 5D Mark III combination caters for a really wide angle landscape view while the Canon EOS 7D Mark II caters for a tighter crop landscape photograph especially when the landscape scene is very big! We said Sayonara to Mr Yamamoto Sensei for spending precious time with us that evening, each of us got nice Hokkaido photography postcards from Mr Yamamoto Sensei for memories! We took a group photograph with Mr Yamamoto Sensei before going to our hotel Shiretoko Daiichi Hotel. 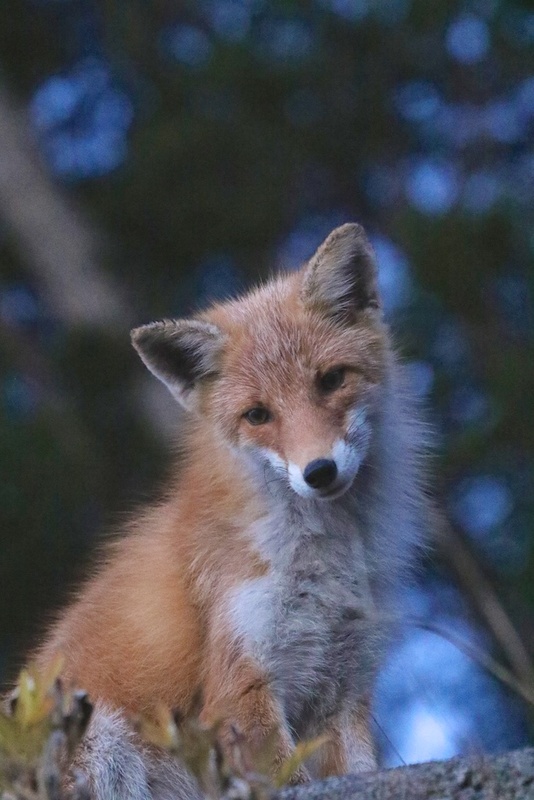 Before we could setup our group photo shot, a Hokkaido wildlife animal came pretty close to us, watching and observing the whole group of us in action, the fox was curious at us human beings and observed us for a while with cute mesmerizing eyes. With the fox that near to us and we all photographers could not resist concentrating our cameras on the fox! I wonder what did the Hokkaido Fox say? The Shiretoko Daiichi Hotel is a beautiful hotel, nice and comfortable! Love the view from my hotel room! The Shiretoko Daiichi Hotel was also where I experienced Onsen for the first time in my life and wearing a Yukata to dinner and Onsen! The buffet dinner was delicious and there was a widespread of local and international cuisines! I am grateful to Mr Kato-san for sharing with me how to wear a Yukata properly for the very first time! My first ever Onsen, at Shiretoko Daiichi Hotel, was simply magical, the experience was unforgettable, therapeutic and relaxing! With the conclusion of my first ever Onsen experience, it also marked the end of Day 1 of our Hokkaido Photographer Invitation Program.